Shelby was not an anomaly; there were quite a few North Carolina towns whose limits were originally prescribed by a perfect circle. Shelby just happened to be the only one large enough to be depicted as such and that still retained its circular shape at that time (at least on the state highway map). 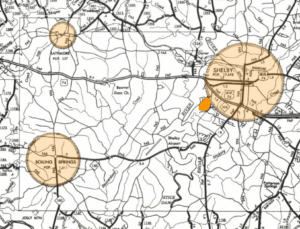 An excellent source for locating North Carolina “circle towns” is the series of highway maintenance maps of individual counties, such as the 1962 series available here. 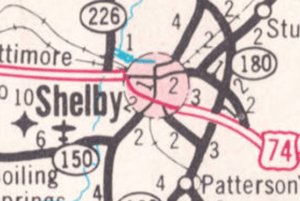 Below is a close-up from the Cleveland County map of 1968; it reveals that Shelby had already developed a “growth” on its southwest limits. Nearby are the perfect circles of Lattimore (top left) and Boiling Springs (bottom left). The original boundaries of towns are described in various volumes of the proceedings of the state’s General Assembly. For circle towns, the description provides a central point and a radius of a given distance from that point. The central point could be a courthouse, a train depot, the local high school, a railroad bridge, or “a certain white oak on the east side of the public road, near a well at the stores of Rogers Brothers and Cowing Brothers.”1 In 1889, founders of the town of Clyde made a knot in the door of the train depot the center point for their circular town.2 Clyde is still a mostly circular town. Enigma, Georgia: Mystery of the South’s Circular Towns, by Frank Jacobs. Circle Cities, by Sarah Michael Levine. This entry was posted in 20th Century and beyond, Town Plans and tagged circle towns, shelby by crmaps. Bookmark the permalink. Norris (1. in the above references) reports the existence of circle town(s) in Indiana, but does not provide any examples. 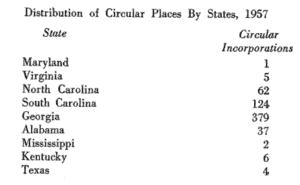 Given the large population exodus from NC towards KY and IN in the early/mid 19th century, it wouldn’t be surprising if someone “carried” a circle with them to Indiana. However, I have yet to locate one. Sounds like a good question for Maps-L tonight when I have more time.